I am installing new Yamaha 9.9's into our PDQ 36. What is the trick to removing and installing to minimize back aches? We have a hard top, but I'm not sure I want to stress the aft part of the hard top. I was thinking about using two 4' 2x4's spaced apart and bolted together and using a come-along sitting between the 2x4's to raise and lower the engine to the top of the engine bay and then just doing a two person lift on each end. Thoughts? Also, is the steering lock on the 2012-newer 9.9's sufficient or should I look at locking it down better? It appears there is a cam-like mechanism that preloads a fiber washer, all friction only. It looks like it could be okay but I'm not sure. Re: Installing new engines and engine steering lock- tips? Built in steering lock is good enough, no issues. 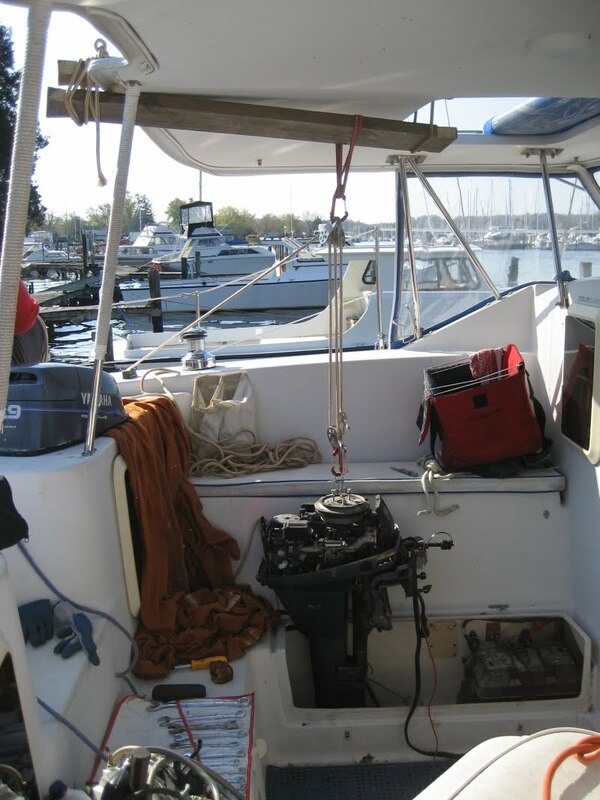 For the lift I use the main halyard through the window in the hard top. Mine is a 32 but I've used this on other's 36's too. If you have the top only openings then cut a "pool noodle" down the side and place that over the edge while working on the engines, it'll save you some ache. Where is you boat at? Maybe one of us can come lend a hand? Thanks Tom! The main halyard through the hard top opening should work, and I can use a pool noodle for chafe protection as you suggest. Brilliant! Our boat is at a private dock on Merritt Island near Dragon Point (just north of Mather's Bridge). I have some help already, but really appreciate your offer! Another question for everyone- it seems the newer T9.9's have a shallower pitch standard prop (7in vs 9in). I hear they have more low end, but how much does this affect top end speed? Here is a post on pulling and replacing engines. I generally worked alone and my back is weak, so the ergonomics are good. It's some work--no getting around that--but physical strain is not bad. As for not straining the hard top, the engine weighs lass than you. Just be cautious not to keep winching if it is stuck on something. Easy. I found it easier to us a spin sheet and a tackle (more precise movement) but I'm sure it is boat-specific. Also, unless the opening is exactly over the engine, you will be fighting yourself. As you can see, on the PDQ 32 it is offset. I have used this mechanism on 2 engine swaps and wouldn't change a thing. I doubt the top end is going to change by more than a few tenths of a knot, and when running on one engine (common) it might be better. My boat is just around the corner from yours. We're at waterline marina off the Eau Gallie river entrance. Sitting there sad and lonely while I work too much but if you need help I'lol do what I can. makala wrote: Thanks Tom! The main halyard through the hard top opening should work, and I can use a pool noodle for chafe protection as you suggest. Brilliant! Our boat is at a private dock on Merritt Island near Dragon Point (just north of Mather's Bridge). I have some help already, but really appreciate your offer! major parts. The track and car set up could easily be adapted to a hard dodger. Great back saving ideas everyone. In the end, I just lifted them out and put the new ones in by hand. It wasn't bad at all and the lift line acted as a safety to some degree. With the new remote cable setup, I am pretty sure I could have an engine out in 10 minutes. Much easier for sure. I had to cut some fiberglass out for the shift cables since they extend forward further. I also file-d the underside of the nacelle and installed chafe protection around the shift cables since they were getting cut on the sharp nacelle floor when they were in the down position. Same for the nacelle to cabin pass thru- I installed some shields tube over those too. I also replaced the engine wiring- I had to cut the old ones to remove and re-route the new ones through the shift base pedestal instead of the conduit by the steering cables. These are cool boats, I love the simplicity!